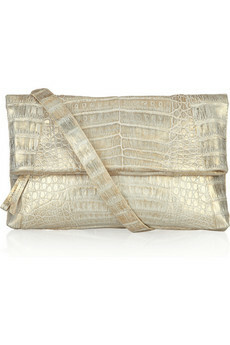 The pale gold metallic crocodile skin on this clutch is one of the most extraordinary materials I've ever seen. I'm not just saying that' it is truly fantastic and I've never seen anything like it. The Gonzalez line calls this color gold, but that's not really doing it justice, because the shimmer on it makes it look more like pearl or opal. The shape, like most of Gonzalez's designs, is nice and simple. It's a simple fold-over envelope with a convertible strap that makes it very versatile. This is one seriously glamorous evening accessory, and at $1,900, it's extremely reasonable for such a luxurious exotic piece.